H-542 "Hopscotch" 2' 1" x 8' Hooked Rug(CLICK SIZE BUTTON BELOW TO VIEW SIZES AND PRICES). H542 HOPSCOTCH. Beautiful hand tufted rug. Hopscotch is made up of olive greens, and taupe backround. 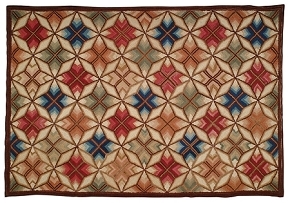 Geometric rust/golden cream colored triangles repeat themselves down the center of the rug. 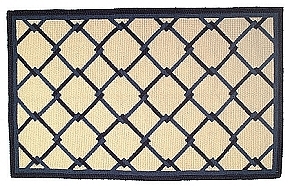 Finally a rust scroll and navy border edge this fantastic rug. It has a very arts and crafts feel! Will warm up any home. Available in 2' x 3' and a 2' x 8' runner.